AP ImagesT-Mobile CEO John Legere, center, rings the opening bell at the NASDAQ Marketsite to celebrate T-Mobile’s move to NASDAQ and the company’s third quarter earnings report, Tuesday, Oct. 27, 2015 in New York. T-Mobile is adding a lot more investors. The wireless phone company is giving every postpaid subscriber one free share of T-Mobile stock in a new rewards program called “Stock Up.” Additionally, for every new customer a subscriber refers to T-Mobile, the referring party will receive another share of T-Mobile up to 100 shares. “Get ready for a gratitude adjustment, America! This Un-carrier move is all about giving you a good thanking! No strings. No gotchas. Just ‘thank you for being a customer! '” said CEO John Legere in a release. The service is set up through the online brokerage Loyal3, and according to T-Mobile there will be no fees for customers to trade the stock through the platform. 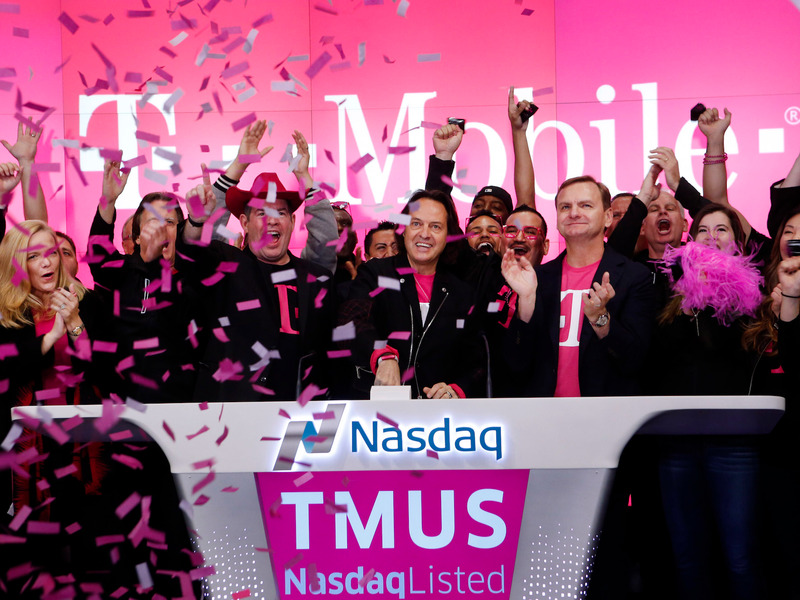 According to a filing with the Securities and Exchange Commission, the company is issuing 1 million shares of new stock, well below the 29.4 million postpaid phone subscribers at T-Mobile. Though it should be said that the stock offering if only for heads of accounts and only customers with smartphones. Each share is registered for issuance at $42.445 according to the filing. T-Mobile will also be offering rewards such as airline wifi, food from Dominoes and Wendy’s, and more. Most corporations say “thank you” with rewards and loyalty schemes that are not much more than thinly veiled attempts to manipulate customers into forking over more of their hard-earned cash. 7 in 10 (72%) people see through it and agree loyalty programs exist to squeeze more money out of them. That’s why 90% of comments about loyalty programs in social media are negative and why customers don’t bother to use well over half (58%) of the programs they’re on. T-Mobile is turning all that on its head by saying “thank you” to customers and asking nothing in return. With Stock Up and T-Mobile Tuesdays, you don’t have to spend more, stay longer, collect points, or qualify for special, elite tiers to be thanked for being a customer. Un-carrier 11 is about T-Mobile showing its loyalty to customers — not the other way around. Customers can claim the initial stock June 7 through June 21.